Whether you have full-, part-time or no employment, you can start a house cleaning business to earn money. All you need are the right supplies and a quality work ethic. 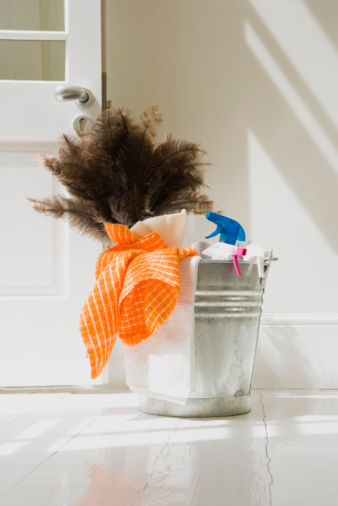 Get your supplies together to start your house cleaning business. Check your state's laws as to whether you need a license to operate your business. Get insurance for peace of mind. This will protect you should anything valuable break or should you be accused of taking an item. Gather all your cleaning supplies in an easy-to-carry kit. Most houses have their own vacuums and brooms, but always bring yours along just in case. Decide what cleaning services you will offer. For instance, maybe you're willing to clean and sanitize the whole house, but you're not willing to pick up clutter or do laundry. Decide your pricing (whether by the room, square footage or hour) and what days and hours you will work. Advertise. If you live in a big city, Craigslist.org is the easiest way to post an ad, and it's free. You can also use the newspaper, or post a flyer in your neighborhood with your phone number. Be sure to specify your hours, pricing and contact information. Talk with your clients and get to know them before you go on a job in their home. Make sure they are trustworthy, and show them that you are trustworthy as well. Ask them if they have any requests. Ask if they have anything they do not want you to move or touch, such as the husband's brand new plasma TV. Talk about payment before you start the job; let them pay only after you are finished. Do a thorough job! Make sure you didn't miss anything and that the client is satisfied with your work. Tell your clients you love cleaning and to recommend you to their friends.